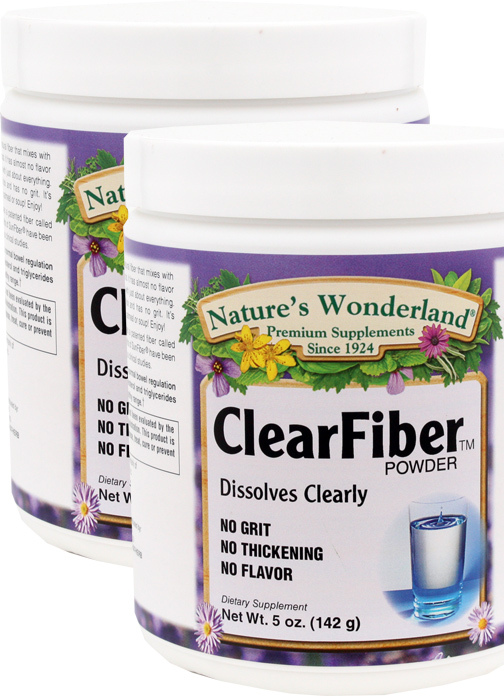 Clear Fiber™ Powder, 5 oz / 142g each (Nature's Wonderland) - Penn Herb Co. Ltd. Nature's Wonderland ClearFiber™ features the clinically studied SunFiber®. It helps normal bowel regulation and also keeps cholesterol and triglycerides within a normal, healthy range. Mix the taste-less powder in most liquids and foods, including juice, oatmeal, and soup with absolutely no grit nor thickening. 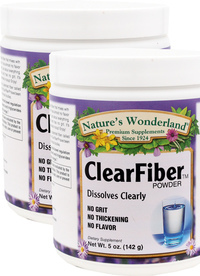 And best of all, ClearFiber™ supports digestive health without the intestinal discomfort and gas that sometimes happens with other fiber remedies. Experience The Clear Difference for Better Results. Clear, soluble fiber may help normal bowel regulation and also keep cholesterol and triglycerides within a normal, healthy range. No grit. No thickening. No Flavor. Gluten-Free. As a dietary supplement, adults mix 1 tablespoon into 4 oz or more of liquid or soft food. Stir until mixed. Note: ClearFiber™ does not change the taste or texture of most foods and beverages that it is added to. Do not use in carbonated beverages.